Official weather reporting station from Little Palm Island Resort. Our first major cold front arrived yesterday... Dropping temperatures from around 80 degrees down into the 60's... yesterday morning was beautiful, no wind, 60 lb. tarpon crashing bait at dawn and water temperatures near 80... The cold front hit mid day... Cool dry north winds collided with warm moist air, creating solid cloud cover and dropping air temperatures into the high 60's.. Speaking of tying flies.. Check out what Stuart is tying.. This weekend???? 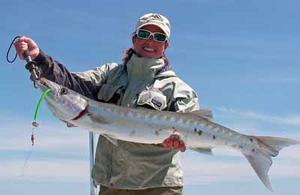 Looks like a great week end to go barracuda fishing!!! Forecasts call for sunny days with temperatures in the 70's .. Cudas will move on to the flats with the tide.. seeking warmer water and prey.. Been finding some redfish too on the lower tides..